Nereid was discovered in 1940 by Gerard Kuiper. It is Neptune’s third largest moon. It has the most eccentric orbit of any moon in our solar system. Because of this, the distance between Nereid and Neptune vary greatly. At its closest, Nereid is a mere 841,100 miles away from Neptune. At it’s farthest, it’s 5,980,200 miles away. Because of how far away from Neptune Nereid’s orbit takes it, it takes 360 Earth days to complete one full orbit around the planet. This small moon was discovered in 1789 by William Herschel. Its average diameter is 246 miles. What makes this moon of Saturn stand out is the 88 mile wide, 6 mile deep impact crater named Herschel Crater. Herschel Crater is not the biggest crater found on a moon in our solar system, but it is quite amazing. 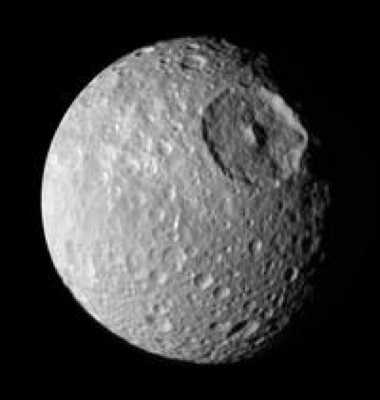 It covers a staggering one-third of the surface of Mimas, and makes this moon resemble the Death Star from Star Wars. Discovered in 1671 by Giovanni Cassini, Saturn’s moon Iapetus has been called one of the strangest in our solar system. It is 914 miles across, and is tidally locked with Saturn. One amazing thing about this moon is the stark difference it has in color and reflectivity. Half of the moon is as dark as coal, while the other half is exceptionally bright. Because of this, and being tidally locked with the planet, you can only see the moon when it’s orbit brings it on the western side of Saturn. It also has a mountain range, or “equatorial ridge,” that is 6 miles high and wraps around the equator. 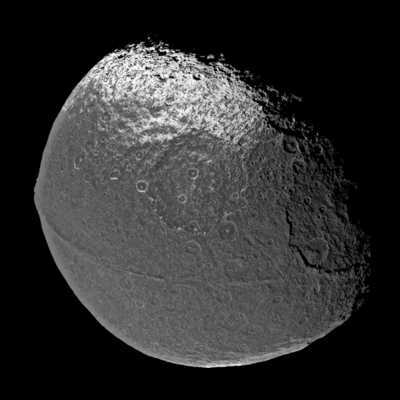 There are two leading theories on how these mountains were formed – some scientists think the ridge was formed at an earlier time when Iapetus rotated much faster than it does today; others think the ridge is made of material left from the collapse of a ring. 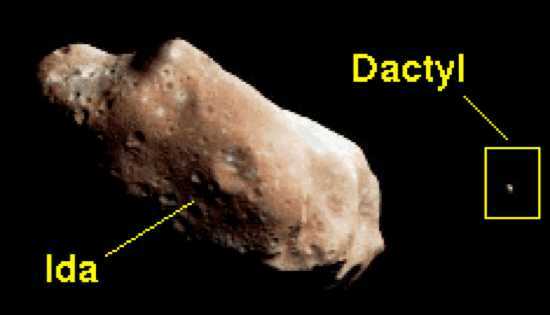 Discovered in 1995 by the Galileo spacecraft, Dactyl is a moon, less than a mile in diameter, of the potato shaped asteroid Ida. 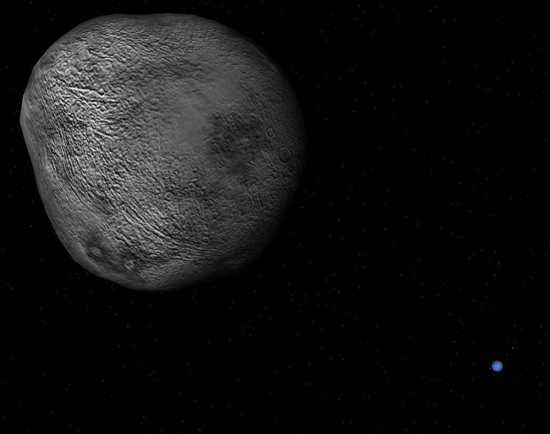 It was the first moon discovered orbiting an asteroid. Scientist are unsure if the tiny moon is a piece that broke off of the asteroid, or if it was captured by the asteroid. It was the first evidence scientist had that asteroids had satellites. Since its discovery, over two dozen moons have been discovered orbiting asteroids. 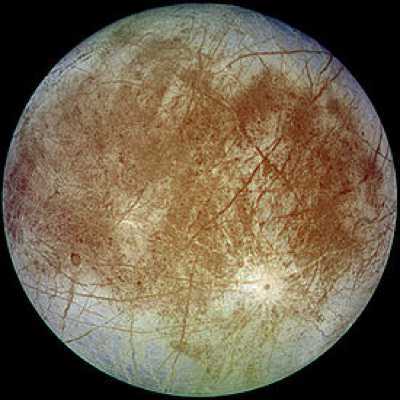 Europa was discovered by Galileo Galilei in January 1610. It is only slightly smaller than our own moon. The surface of Europa is striking, with dark lines criss-crossing it. Many scientist believe the lines on the surface are caused by eruptions of warm ice as the crust splits open. The moon is tugged on by Jupiter and Jupiter’s other three major moons, splitting the crust and enabling this to happen. As beautiful and intriguing as this makes Europa, it’s what scientist believe is below this thick crust of ice that makes Europa amazing: a salty, liquid ocean of water. Unlike Earth, it is believed the ocean on Europa is deep enough to cover the surface. Since Europa is far away from the sun, the ocean has frozen over, creating a 62 mile thick ice crust. But through tidal heating, it is possible the interior ocean has managed to stay in a liquid form. 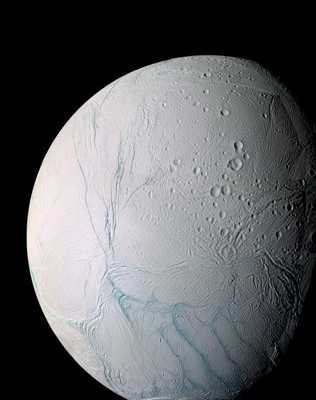 Enceladus, the sixth largest moon of Saturn, has been featured here before. But when making a list about amazing moons, it definitely deserves a spot. Enceladus was discovered in 1789 by William Herschel. It is the brightest body in the solar system. It reflects almost 100% of the sunlight that hit its surface. This also makes it extremely cold, about -330°F. While is does have some craters, there are other areas that show regions with no craters, indicating major resurfacing events in the geologically recent past. The south polar region sports large, dark cracks called “tiger stripes,” house-sized ice boulders and evidence of recent geological activity. The tiger stripes also spew tons of material into the air, which actually makes up Saturn’s E ring. 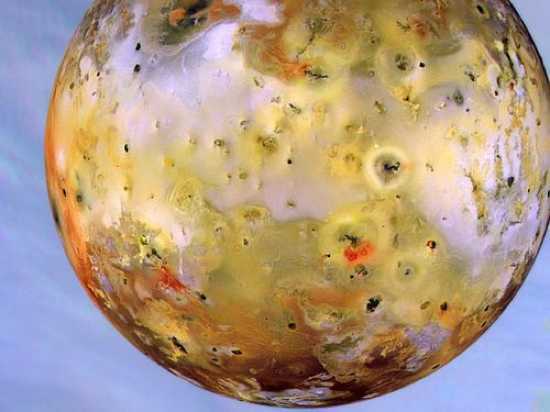 Io was also discovered in January 1610 by Galileo Galilei. Io is a little bigger than our moon. It is the most volcanically active place in our solar system. It is riddled with volcanoes, where they spew matter 190 miles above the surface. Normally, an object the size of Io would have become geologically inactive long ago, but because of the orbital resonance Io is in with Jupiter, Europa and Ganymede, it is subjected to tremendous amounts of tidal heating. It is stretched and pulled on by Jupiter and the moons so much, that they cause the surface of Io to bulge up and down as much as 330 feet in some places. This tidal heating keeps most of the subsurface in a liquid, molten form, and gives it the ability to constantly renew its surface. 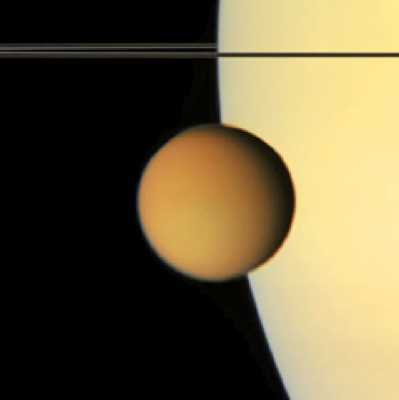 Titan, the only moon besides our own to have a probe land on its surface, was discovered in 1655 by Christiaan Huygens. It is the second largest moon in our solar system. It is covered in a thick, hazy atmosphere of mostly nitrogen, methane and ethane. The moon is very well-known because it is the only moon to have clouds and a planet-like atmosphere. It is also the only other place in our solar system to be known to have flowing liquids on its surface, although the liquids on Titan are methane instead of water. Triton was discovered in October 1846 by William Lassell, just 17 days after Neptune itself was discovered. It is the largest moon of Neptune. It is unusual because Triton is the only large moon in our solar system that orbits in the opposite direction of its planet’s rotation – a retrograde orbit. This suggest that Triton is a captured moon, since all natural satellites in the solar system orbit the planet in the same direction. The problem scientists have encountered is trying to figure out how such a large moon could be captured. 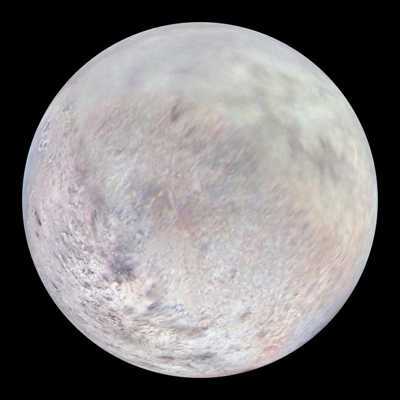 Triton is one of the coldest objects in our solar system. When Voyager 2 did a flyby in 1989, if found Tritan to be -391°F. That is only 68.67°F above absolute zero. Voyager 2 also found Triton to have active geysers, making it one of the few geologically active moons in our solar system. 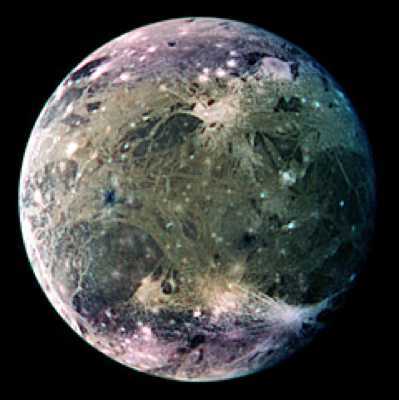 Discovered in 1610 by Galileo Galilei, Ganymede is the largest moon in our solar system. It is larger than the planet Mercury, and is three-quarters the size of Mars. It is so large, that it would be considered a planet if it did not orbit Jupiter. The most amazing thing about Ganymede is it is the only moon in our solar system to produce its own magnetic field. It has a molten iron core which makes this possible. The magnetic field is embedded inside Jupiter’s massive magnetosphere. In 1996, The Hubble Telescope found a thin atmosphere of oxygen around the moon, although it is too thin to support life.